I am very excited about writing this article as it has enhanced my coaching philosophy and approach ten fold. I will try to explain the process and the reasoning as I go. 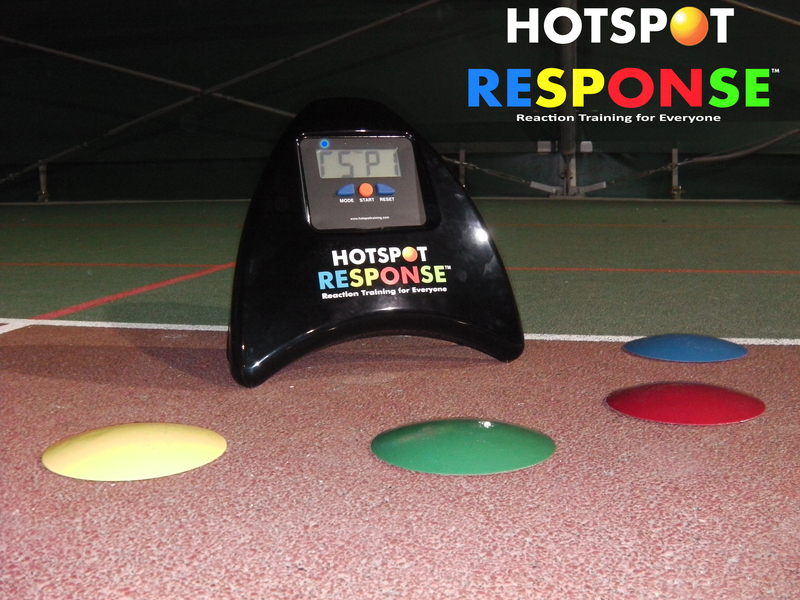 This evening (Monday 20th Feb 2012) I took the protoype Response System to my coaching to see what the reaction (ha) would be to the system from a player perspective and also to see how my coaching would / could alter. I set the system up for a 20 second work period, set up a square about 2×2 metres and explained that the light would come on and that they (the player) are to move to the corresponding dot. Then they were to look for the next light and move to that dot and onward. I also used the other features to stimulate, engage and challenge the players. The first thing I noticed was that the players movement was really stretched by this implied reactive pressure. The intensity level was through the roof and the enjoyment was great to see and they applied themselves really well to solving the movement puzzles presented by the system. I trained 4 players in 3 different sessions and the differences between them were very interesting. Physical competency played a part in the measured output of the players. It was evident that from an anatomical / functional point of view that better posture and movement capability in all planes resulted in better scores. I think this is quite accepted but probably missing from many coaching sessions, particularly sport specific coaching sessions (I am working on a series of articles to address this). Most sports require some reaction to a stimulus and then to move and execute some action. This reaction to the stimulus is of interest. In most, “reaction” trainers that I have seen there is no requirement to move from position A to position B. In this case, the reaction trainer, for me, has been a difficult concept. With Response however, there is a requirement to move and this requirement can be as big or as small as desired. The pressured style of movement that was observed suggested that the message from the reaction to the muscle groups was delayed and/or confused. Interestingly, the players who could play tennis at higher tempos and more consistently were observed to move more fluidly in response to lights changing. Over the part of the session I used the Response, I altered drill patterns and distances, exercises, the position of the lights (moved the system to the other end of the court) and created movement puzzles for the players. This seemed to be very engaging and the work rate was fantastic. Improvements were made with some confusions within the drills popping in and movement mistakes being made. This provoked my thought process to consider the possibility that players thoughts were clouded when performing the sport and the focus was not on simply playing. The idea of working with the subconscious is a concept that I was recently presented at Anatomy in Motions level 3 (Gary Ward). Tennis is a busy sport and there is all manner of possible things players can be thinking about when performing drills, points etc that may have either effect on their outcome, i.e. positive/negative. Thoughts associated with thing like where they are hitting, how they are hitting, does the ball have spin, oh no I missed etc. When players observed a new light they automatically performed a split step and this was very prominent during the activities with response. However, when playing/drilling in tennis this step is sometimes missing, maybe due to drifts in focus, time delays in the stimulus, relief after sending the ball back. They likened a new light to the contact point of the opponent and decided that they would shout the word “GO” as loud as possible in their head as they saw/heard the contact. The aim of this was to fill their head with the word and it’s noise thus impeding other thoughts to enter their mind. The impact of this was that the movement and court coverage was drastically improved and I was able to really pressure them with the feeding. Taking it a step further, I wanted to reduce the thoughts whilst hitting so we chose words such as “Bang” “hit” linked with breathing out through their own contact. The words were again shouted to fill their head and when I asked what it was like, they said that the words took as long as the breathing out, BaaannnGG for example. The aim of this was to allow the body to just do as it knows best. Results again were good and the players had a really positive response to the work. We had stronger strokes, higher rally tempo, increased consistency not to mention more fun. Reaction is one thing but body function is a limiting factor where required to move and execute. This means that, as a prerequisite or in conjunction with, there must be attention to the body requirements (in 3D). It allows the players to just do and correct (attacking the subconscious effectively). 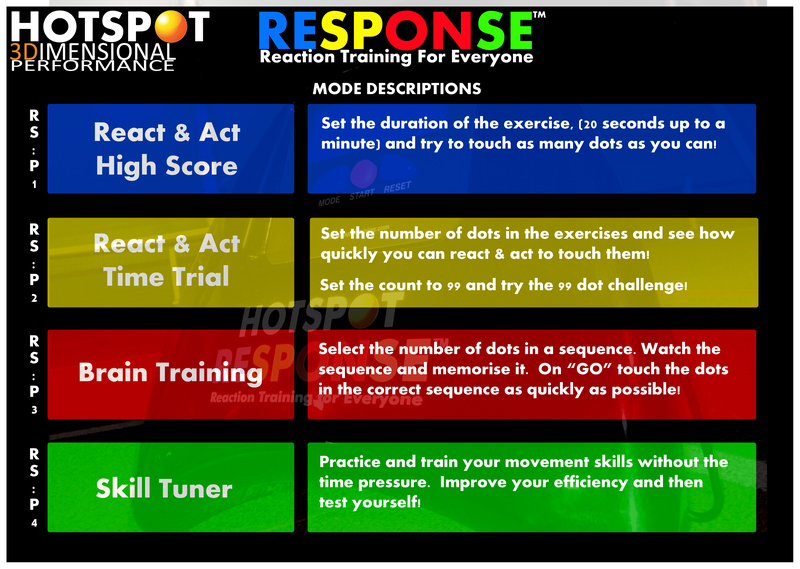 The Response is a great tool to engage players, make training useful and linked to the sport, provide significant challenge and aid in making performance related improvements. Tennis is a dynamic sport requiring a host of skills in order to play the game well. Alongside techniques of strokes, tactical understanding and mental abilities is that of movement and footwork. These would come under the heading “physical” but is more than simply going to the gym and crunching weights or running on a treadmill. Tennis movement is specific and in phase 1 the aim is to introduce you to simple movement concepts that you can improve and that will also double up to improve your fitness. Movement in tennis can be broken down into 3 vectors. Vectors must have direction and a magnitude. In this case we look at direction and 2 “magnitudes,” distance and speed. Tennis movement can be simply broken down into 3 or 4 distinct types. To know if you are improving you need to measure the drills. Hotspot can help you do that and provide accuracy and repeatability so that you have the confidence that you are improving. To use the Hotspot system with the drills outlined is simple. Well so far on this blog I have posted my archive of articles. 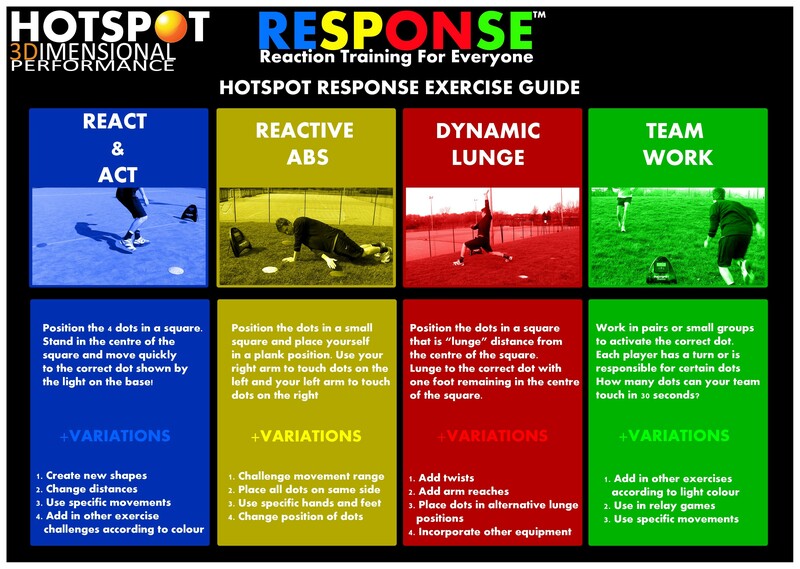 This is content I use when I demonstrate the Hotspot Training System in how to maximise its use. Now, interestingly enough all this developed from a simple question..How do you know? How do you know you are getting better at certain things? “I am winning more” are valid but there is more to it..isn’t there? How do I know if I am getting better at the agility drill or the tennis movement drill or that movement pattern. How do I know if that extra weight I am lifting is helping me get faster and hit harder? The answer is you don’t! The only way to know is to measure. Now that is tough because off technology costing so much or in fact it dosnt exist. Whilst at University in America I trained in the gym to improve my tennis. I could see strength gains and I could run for longer but I had no idea whether I my foot speed was improving, or my agility was improving or my speed around the court. Vague attempts at measuring were made but we used to make it up (don’t tell coach van dyke at SBU tho!). As a result of this the Hotspot concept was born. It is affordable, simple to use, can measure agility drills accurately, does force good mechanics and control and is repeatable for monitoring improvement.